T.O.P. QUALITY SRL, is an ISO 9001:2008 certified company producing small metal parts obtained from strips and wires. The company is located in via Giotto n° 4/6 in Presezzo (province of Bergamo) and it covers a surface of 2500sm. Thanks to advanced technology machines like Bihler and Bruderer it can produce sheared, bent and assembled parts, simply starting from customer’s drawings. Shearing small metal parts has a consolidated tradition in the Meles’; in effect Mr. Pietro Meles was involved in such a business activity in the city of Lecco as long ago as 1950. Mr. Giancarlo Meles was appointed as Technical Director of the company set up in Bergamo in 1964. Mr. Giancarlo Meles was appointed as Technical Director of the company set up in Bergamo in 1964. After more than 40 years experience in the shearing sector, in 1991 he decided to set up, together with his son, Claudio Meles, a new company called T.O.P. 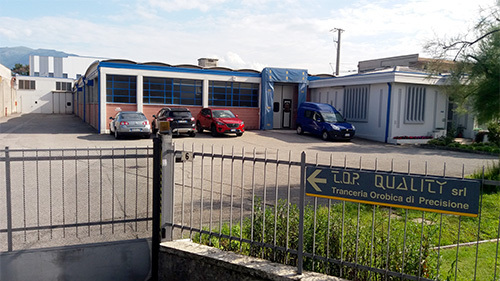 QUALITY with seat and factory in Medolago (province of Bergamo). In 2001 the company became bigger and it was moved to the new seat in Presezzo (province of Bergamo). In these years we have made important investments and we have increased our machinery fleet in order to create a medium enterprise able to produce precision small metal parts responding to customers’ quality needs and conforming to current regulations. The strength of companies like T.O.P. QUALITY Srl is not their business dimension, but the competence of their staff and the steady acquisition of Know-how, qualities that can be reached only after years of experience in such a competitive industrial sector.